Reading poetry aloud together is a perfect way to instill a love of reading, rhyming and remembering. 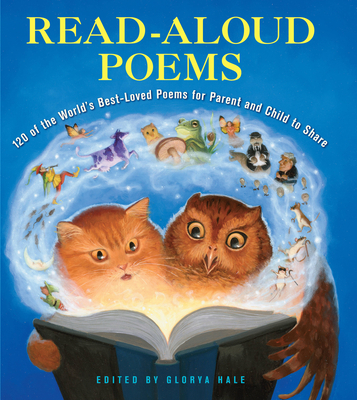 READ-ALOUD POEMS includes 120 age-appropriate poems from renowned poets around the world-including Shel Silverstein, Maya Angelou, Emily Dickinson, Lewis Carroll, and Edward Lear-in a charmingly illustrated volume perfect for sharing. From nursery rhymes to nonsense songs, from lullabies to lyrical nature poems, READ-ALOUD POEMS will inspire, enchant, and delight readers of all ages. The more than one hundred selections are beautifully illustrated in color throughout, and organized into subject sections like "Earth & Sky," "Meet the Family," "Laughing Lyrics," "Poems that Tell Stories," and "Nature." Concise sidebars include biographical information about select poets. Designed for sharing, READ-ALOUD POEMS can make poetry a bonding experience for parents and children. Look for Read-Aloud Classics and Read-Aloud African-American Stories too.